V(D)J recombinations in lymphocytes are essential for immunological diversity. They are also useful markers of pathologies, and in leukemia, are used to quantify the minimal residual disease during patient follow-up. High-throughput sequencing (NGS/HTS) now enables the deep sequencing of lymphoid populations. With dedicated Rep-Seq bioinformatics methods and software, clinicians and researchers can now qualify and sometimes quantify the heterogeneity of these lymphoid populations. This third workshop is intended for users and developers of Vidjil, to share experience, protocols and results, to raise questions and decide development priorities, and possibly to set up new collaborations between biologists and bioinformaticians. The workshop will include an invited talk by Jack Bartram, hematology, immunology and bioinformatics talks from the users and developers of Vidjil, and practical hands-on sessions on participant data. The previous workshop gathered 36 scientists from 6 countries. The workshop will include invited talks, hematology and bioinformatics talks from the users and developers of Vidjil, and practical hands-on sessions on participant data. We expect that one participant from each group will do a short presentation of his research or clinical work, and, if applicable, of the results obtained with Vidjil or with other software. For the practical sessions, the participants are invited to bring a laptop and some of their NGS data (fasta / fastq / fastq.gz files). The data can also be uploaded before the workshop into user accounts on app.vidjil.org before the workshop. We also provide public test data for the people who do not currently have their own NGS Rep-Seq data. 19:30 Dinner, restaurant De Rode Koe, in Lille. Stop at the Rihour metro station. Discussion on library preparation, sequencing instruments and protocols, bioinformatics analysis. Conclusion on development priorities. The two lunches (18 and 19 March) and the dinner of the evening of the 18 March are free for registered participants. Registration deadline : 28 february 15 march 2018. It is still possible to register for the workshop, however we do not guarantee now places for the lunches and the dinner. 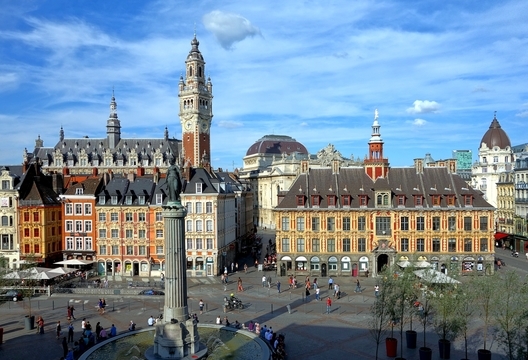 Lille is a lovely city at the heart of French Flanders. With TGV, Lille is 1h from Paris, 1h20 min from London and 35 min from Brussels. The workshop takes place at CRIStAL M3 building, in the heart of the Lille 1 Campus, at 20 minutes from Lille center. From Lille center, take the metro line 1 (yellow), direction 4 Cantons. Stop at the Cité Scientifique – Professeur Gabillard station. The CRISTAL M3 building is 500 meters from the metro station. The workshop is organized by Mathieu Giraud, Mikaël Salson, Florian Thonier, from CRIStAL, Inria Lille and the VidjilNet consortium.